It’s been a busy few months here in Lancaster. Since my last PhD diary update I’ve spent a fair amount of my time working on various projects for publication including two book chapters and a paper for Foundation which should appear (I hope) in Spring 2019. I’ve also started on a project to self-publish a novel I wrote several years back, and am looking forward to teaching first year undergraduates in the English department starting in October. I’ll be honest: it’s been a while since I last looked at my thesis. I passed my confirmation panel around Easter time and have a good idea what I need to do to get my thesis read for submission next year. Once I’ve got my other work out of the way I aim to return to my draft chapters in October, hoping to have a fully compiled ‘first draft’ of sorts by the end of the calendar year (I hope!). These last few months have all been about publishing and I’ve spent a good deal of time researching and writing two chapters on 1960s science fiction for a book I’m contributing to which I hope will be published at some point next year. 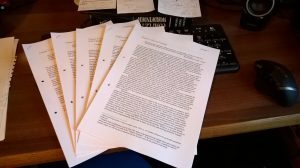 At the time of writing I’ve just finished drafting the second of the two chapters and will revise these over September so I can return at last to my thesis. Aside from two book chapters I’ve also had a piece accepted for Foundation, to be published next year, as well as a contribution to (un)Ethical Futures, though I’m still awaiting feedback from the editors. All in all this should give me at least four publications to list on my CV by the time I graduate, with a couple more projects also in the works. Since my last update I’ve presented at both After Fantastika (Lancaster), and CRSF (Liverpool). 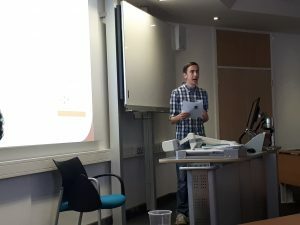 I’ve also been accepted to speak at this year’s NWCDTP conference in Salford, and am on the lookout for other events to apply to for the next academic year. I admit I’ve been a bit lax with my own blog of late, however I do still contribute to TTAC21, where we read and dissect papers on all manner of subjects relating to technology, terrorism and modern warfare, terrorism. We’ve even recently read some short stories published by American military personnel that featured in a writing competition, which I found particularly interesting. Our collected thoughts on these stories will feature in a blog post to be published in a few weeks’ time. I’ve recently been employed by two more colleges at Lancaster University to migrate their websites into new web templates on the University CMS. These websites are both nearing completion, and I look forward to sharing my work as soon as the websites are made live, hopefully before the start of the next academic year. Once these websites are published that will mean I’ve built websites for five of Lancaster University’s nine colleges. This is a particularly significant achievement given the importance of the college system for student recruitment and retention here at Lancaster, which I hope goes to show the value I add to the institution. Regular readers will know I recently announced plans to publish my Young Adult novel, The Darkest Hour. I’m pleased to say this project is progressing really well. I’ve already given feedback on some initial cover designs and am awaiting further updates to come. After that, it’s down to formatting and typesetting before uploading to the various publishing platforms I will use to distribute my book. I have to say I’m really excited to share the previews with you, but because things may yet still change, I don’t want to share anything just yet. Needless to say, I’m really happy with the work I’ve seen so far, and am hoping to publish before the end of the calendar year. Aside from all of the above, I’m still working for Student Communications at Lancaster, and for the IT department at CCCU. I’m also Assistant Dean at the Graduate College here at Lancaster, and have recently been involved with several events including our wellbeing breakfasts, PELPs arrivals and the Postgraduate Research Conference, for which we recently published our post-conference report. I plan to spend the next two weeks back home visiting my family. After that it’s back to work on my publishing projects in September, followed by my thesis October to December. All things being well I also hope to have an announcement about The Darkest Hour, I hope, by October.